Indiana returns to Simon Skjodt Assembly Hall for the first time in two weeks as the Hoosiers host Fort Wayne tonight. The Mastodons are 7-5 this season and are coming off an 88-84 win over Stetson. Last November, Indiana went to Fort Wayne unbeaten and ranked No. 3 in the Associated Press top 25 poll. 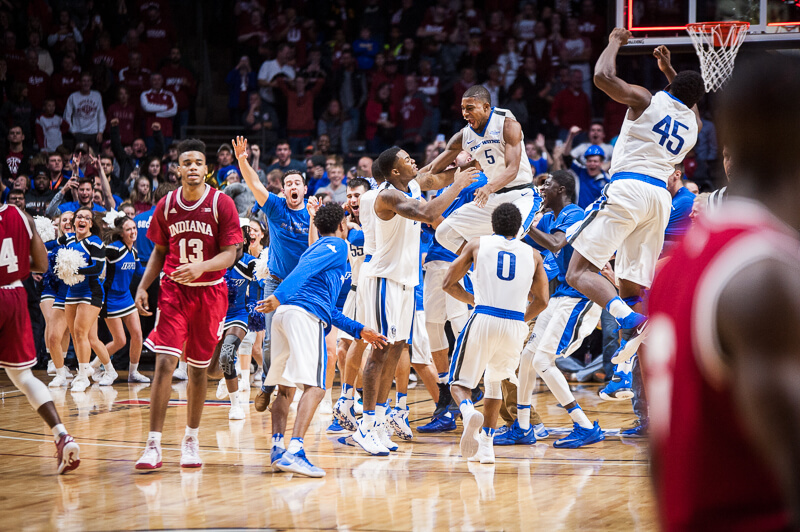 The Hoosiers left Fort Wayne with a stunning 71-68 overtime loss. It was one of several head scratching losses and performances that led to Tom Crean’s dismissal last spring. Indiana will welcome Fort Wayne to Bloomington tonight for the third game in a three-game series that also featured a 90-65 IU win in December of 2015. Still, it will be last season’s upset that will be the storyline surrounding tonight’s game. In the aftermath of IU’s win against Notre Dame, Archie Miller was asked about Fort Wayne and acknowledged that he will remind his team of last year’s game. Fort Wayne returns several key pieces from last season’s team that finished 20-13 and played in the CIT, a third tier postseason event. The headliners are in the backcourt in senior Bryson Scott and juniors John Konchar and Kason Harrell. Scott, who played two seasons at Purdue before transferring to Fort Wayne, is the team’s leading scorer at 22.4 points per game. He’s shooting 54.3 percent on 2s and just 28.1 percent on 3s against Division I teams. Scott is using 32.9 percent of his team’s possession, which is 15th highest in the country according to Ken Pomeroy. The Fort Wayne native excels when he can get into the lane and to the free throw line. His free throw rate (FTA/FGA) is 50.3 percent against D1 competition and he’s knocking down 83.5 percent of his attempts. Konchar, who was lightly recruited out of the Chicago era, is on the NBA radar. He’s a career 46 percent 3-point shooter and has excellent size on the wing at 6-foot-5 and 210 pounds. As Indiana fans remember from last season’s game, Konchar is difficult to stop when he gets a full head of steam going to the rim. Through 12 games, he’s Fort Wayne’s second leading scorer at 14.4 points per game and their leading rebounder at nine per game. Harrell has been inefficient so far as a junior after a strong sophomore season. He’s the team’s third leading scorer at 12.4 points per game, but a high turnover percentage (20.7) and below average 3-point shooting (34.6 percent against D1 teams) are the primary reasons for his backward slide. Freshman Matt Weir is the backup point guard, but his turnover rate (32.2 percent) and poor 3-point shooting (27.6 percent) suggest he’s got a long way to go. Jordon King, a 6-foot-5 senior, is a rotation player off the bench who can hit the occasional 3-pointer and is averaging 6.5 points in 13.2 minutes per game. Up front, Fort Wayne starts senior Xzavier Taylor and sophomore Jax Levitch. Taylor is a solid offensive rebounder (10.3 OR%), but is making less than 49 percent of his 2s against D1 competition. Levitch, a 6-foot-7 forward, is hitting close to 45 percent of his 3s. Dylan Carl, a 6-foot-11 freshman, will also see minutes off the bench. He averages 4.4 points and 3.3 rebounds in 13.6 minutes per game. Fort Wayne has done a solid job forcing turnovers as the Mastodons rank 58th nationally in defensive turnover percentage (21.9). They’ve also, like Indiana, been above average on the offensive glass. Fort Wayne’s offensive rebounding percentage of 32 ranks 97th nationally. For Indiana, taking care of the ball is imperative as is getting to the foul line. The Mastodons are just 1-5 in road games and opponents have taken an average of 24.6 free throws per game in those six contests. The Hoosiers should have a decided advantage in the post with Juwan Morgan and De’Ron Davis. After Davis scored just two points in Saturday’s win over Notre Dame, he needs to reestablish himself over the next three games. The KenPom line is Indiana by 12 with an 85 percent chance of victory for the Hoosiers. The Sagarin ratings like Indiana by 12.5 and the Vegas line is Indiana by 12. Typically, this is the kind of game where the worry of a letdown would be top of mind given that Indiana is coming off of an emotional, come from behind victory in the Crossroads Classic. But this is no typical matchup given what happened to Indiana last season in Fort Wayne. Saturday’s win over Notre Dame gave Indiana’s postseason resume a significant boost, but there’s plenty of work still to be done. Playing on a one day turnaround for the fourth time this season, can the Hoosiers take care of business at home and avenge last season’s loss? You think that’s the scariest info I have? She seems like a sweet girl. Been, you were spot on. Concordia Lutheran. She is the same in person.